Next time you complain your home/apartment/condo is too small, think about the occupants of 128 Day Avenue, a property near Dufferin and Rogers Road. 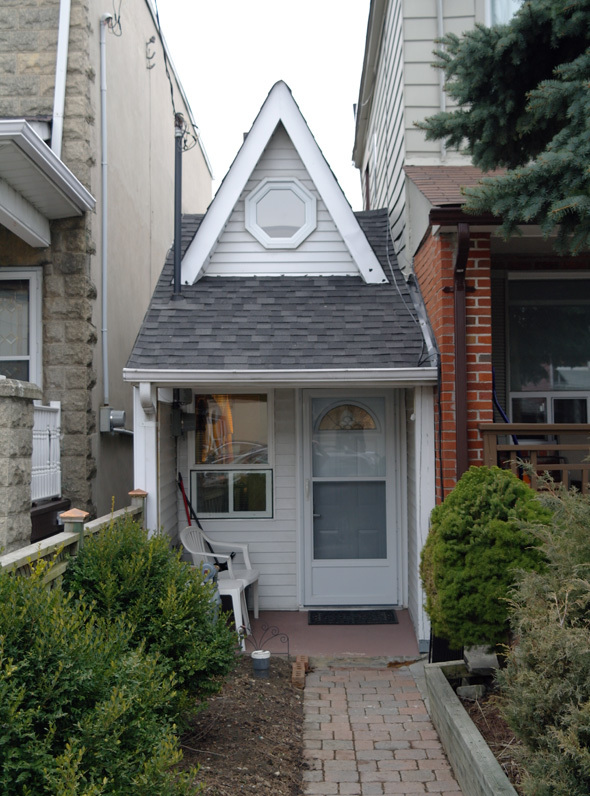 With a footprint of just 29 square metres, the house is officially the smallest in the city. It was something of a minor celebrity a few years back, appearing on the Ellen DeGeneres Show in January 2008. According to its official site (yep, it's that famous), the home was shoehorned into the space between two existing properties by Arthur Weeden, a contractor involved with a series of west end building projects, in 1912. The tiny parcel of land was originally marked out for laneway access but somehow the curb stones were never lowered to allow vehicular access, rendering the gap useless. Weeden pounced, building a pint-sized home, barely an arm's span wide, for him and his wife. They lived there together for 20 years, content in the tiny space, tending to their vegetable garden and bunking down for the night in the single rear bedroom behind the kitchen. When Weeden died, the house passed through several owners. In 2010, the last time it was on the market, owners asked $180,000 - $1968 a square metre - for the smallest house in the city, well below the $400,000 average for the city. The publicity surrounding the sale reached its height when talk show host Ellen DeGeneres featured the property on her show. The main floor of the bungalow features a living room, kitchen, and sleeping quarters with Murphy bed (the room is too small to accommodate a normal bed and furniture.) A hatch in the kitchen leads down to a small basement. The diminutive house has also inspired a song, "Come Back To Me" by Maria Lee Carta.